WASHINGTON, DC -- The National U.S.-Arab Chamber of Commerce (NUSACC), in cooperation with the Export-Import Bank of the United States (Ex-Im Bank), hosted a discussion today with H.E. 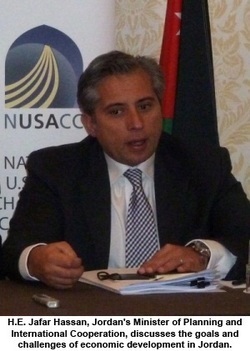 Jafar Hassan, Jordan's Minister of Planning and International Cooperation. The "standing room only" session for a wide range of U.S. companies took place during the Ex-Im Bank's Annual Meeting, held at the Omni-Shoreham Hotel. 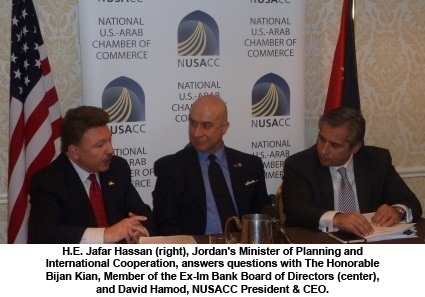 "Jordan has a number of megaprojects in the pipeline that are of interest to U.S. companies, and we are pleased that Minister Hassan was in a position to highlight these business opportunities," noted David Hamod, the Chamber's President & CEO. "Infrastructure development will be key to Jordan's ability to stay ahead of the curve, and no one is better qualified to support this effort than U.S. companies are." Minister Hassan discussed various regional and Jordan-specific projects, including desalinization initiatives for the Red Sea / Dead Sea and regional railways that will connect the Levant and Arabian Gulf countries. The involvement of the private sector is vital, he noted, highlighting the need for American companies to bring their expertise, technology, and experience. "The region is really coming together through a network of infrastructures," Minister Hassan suggested. "In 20 years' time, the geo-economic map of this region will be drawn by the plans that are being implemented today, and U.S. companies are not yet key players in building this network." He pointed out that China, Russia, Turkey, and others are aggressively competing for contracts throughout the region. New projects in Jordan are creating new commercial opportunities for small and medium-sized American businesses, Minister Hassan suggested. Particularly attractive sectors, he said, include healthcare, tourism, pharmaceuticals, mining, energy, and information and communications technology (ICT). He drew attention to the deepening involvement in Jordan of such well know U.S. companies as Microsoft, HP, IBM, Boeing and Cisco -- some of which participated in today's session. The Honorable Bijan Kian, a member of Ex-Im Bank's Board of Directors, stated, "There's so much to explore, lots of opportunities in various sectors, including infrastructure, renewable energy, transportation, and healthcare. The Export-Import Bank is wide open for business with the Hashemite Kingdom of Jordan." Director Kian highlighted the Obama Administration's National Export Initiative, which aims to double U.S. exports to $3.14 trillion by 2015 in order to create an additional two million jobs. U.S. companies are attracted to business-friendly markets that encourage transparency and the rule of law, he noted. ​Minister Hassan spoke at length about emerging opportunities in Jordan and the potential for growth there, despite recent political upheaval across the region. He noted, "I think that the fundamentals for economic growth and the great potential will still be there when the dust settles in many of the countries that are facing turbulence today. If you ask people in the region about prospects for investments, especially business leaders, you will find that they are very positive. I believe that in the long run, the political transformation in many countries of the region will provide a better platform for business opportunities." The U.S.-Arab Chamber forecasts that U.S. goods and services exports to Jordan will reach $2.71 billion by 2013, up from $1.63 billion in 2009. U.S. market share of Jordanian goods imports is projected to grow from 9.7 percent in 2009 to 12.3 percent by 2013, and service imports are on track to reach 14.3 percent by 2013. NUSACC's David Hamod, who just returned from the region, suggested that Jordan today is experiencing three important trends: Vibrancy -- particularly among entrepreneurs and start-up companies; Reliability -- with a strong rule of law and transparency consistent with the Jordan-U.S. Free Trade Agreement; Openness -- providing an important bridge for dialogue between H.M. King Abdullah and the people of Jordan. "Minister Hassan's speech served as a good wake up call," Hamod concluded, "and we're listening."